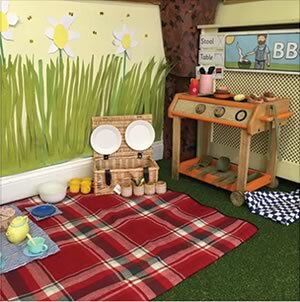 At the Angmering Day Nursery we have adopted an all-inclusive approach to fees for our non-government funded children. Life as a parents is difficult enough without having to remember to make a packed lunch, provide enough nappies and wipes or remember to bring sunscreen, so what do we mean by ‘all inclusive’? Our published fees include all of the following at no extra cost to you. Pampers nappies – or any other preferred type of nappy. Just let us know and we will buy it in for you. Extra-curricular sessions– such as Music sessions, visitors from certified animal experience groups, local interest groups etc.The following price tables show the fees for a full or half day as well as the monthly cost, where we take the weekly fee and multiply by 51 weeks then divide by 12 months. This consistent amount makes it easier for your budgeting and nursery administration. The reason we multiply the weekly amount by 51 and not 52 is that we are closed between Christmas and New Year, so you don’t pay for this closure. Bank Holidays are also not chargeable if your child attends on that day. Funding – there are many sources of financial assistance with nursery fees such as EYFE (free places for 2, 3 and 4 year olds), workplace vouchers soon to be replaced by tax free childcare, student funding, special needs assistance and tax credits. If you need assistance with finding out your eligibility for these types of funding, do please ask. 1pm-6pm Including mid afternoon snack and high tea. We do have some capacity to offer session times outside of those above. These are strictly limited per year. 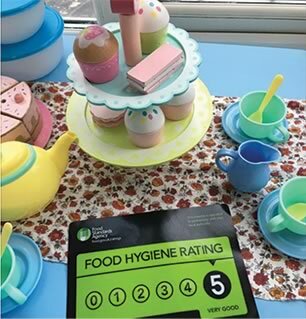 Please discuss this with the nursery manager to see if we can accommodate your requirements. We charge a Late collection fee of £8.25 per 15 min period if you are late collecting your child. This will only be applied under exceptional circumstances. We take a realistic approach to this and understand that occasionally circumstances will prevent you collecting your child within our session times. The late collection fee will only be applied if it is a repeating occurrence. Late payment fee £25.00 Again this will only be applied if there is a repeating occurrence. Non refundable administration fee £35.00, this is charged on submission of our admission forms and is used to cover the cost of setting up your account and your childs ‘Day in the life of…’ folder etc. These will be given to you to keep when your child leaves us. Our fees are payable calendar monthly in advance by direct debit, cash, cheque or nursery voucher by the 7th of each month. If you are paying by voucher then please let us know the company you are using and ensure that your child’s name is used as the reference when the payment is made. 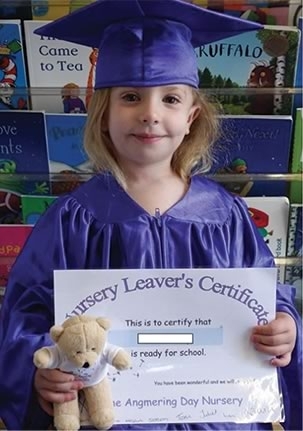 We understand that from time to time changes can occur and we will endeavour to be reasonable given the circumstances. . We need at least 4 WEEKS written notice to be provided of any changes to the booking or when your child finally leaves the nursery. We will try to accommodate shorter notice periods especially if we are able to cover the change with another booking. Unfortunately we are unable to provide refunds for a child’s absence of whatever nature including holidays, sickness and nursery closure due to bad weather. Exceptional circumstances can be discussed with the Nursery Manager. Fees are reviewed annually and 8 weeks minimum notice will be provided before any changes are made. 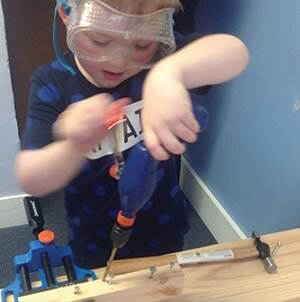 At the Angmering Day Nursery we offer government funded universal entitlement for all our 3 and 4 year olds. We also offer the new extended funding for those families who qualify. As the funding we receive from the government simply covers the cost of the basic education and care of the children, we ask the parents of funded children to make an additional contribution to cover what the Government call “additional services”. Additional services include all food and snacks, and extra curricular sessions such as Music, Little Movers, French and Yoga. Currently the cost of our additional service charge is just £7.50 per week, but is not a requirement for your child to access a funded place with us. We offer 2 year old funding for those families who are eligible. If you feel you may be eligible for this type funding, please contact the nursery manager who will help you to access this via West Sussex County Council. Parents who are able to access 2 year funding are not asked to contribute to additional services. Currently each child is entitled to 570 hours of funded childcare each year from the beginning of the school term following their 3rd Birthday. 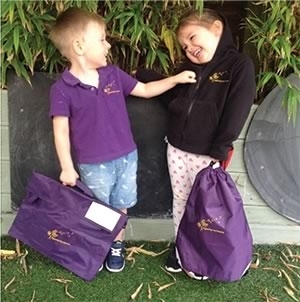 At the Angmering Day nursery we offer stretched funding for the convenience of the parents who attend here. This means that your child’s 570 hours are stretched equally over the 51 weeks we are open. Offering stretched funding means that your child will still be funded for the weeks outside of school term time, eg, throughout August, Easter and half terms. We claim the funding from West Sussex Council on your behalf and this is deducted from your monthly bill in advance. Following your child’s 3rd birthday we will send you an EYFE form which provides details about your child and what sessions you are claiming. This also provides details of any other setting that your child may be attending. Once we have received the funding, we allocate this to your account on a monthly basis i.e. we take the amount of free hours being provided over the year and divide by 12. This amount is then deducted from your bill so you only see the net fee for additional hours. This system is exactly the same for those parents who are also able to access the new extended funding of 1140 hours of government funded hours per year. If you require further details on how to access this funding or whether you may qualify, do please ask Laura or Juliet at the nursery.